Director Henry Edwards' Scrooge does something similar to Zemeckis' when it comes to the door knocker. Scrooge doesn't drop his keys in this version, but he does stand and fumble for them for a second. 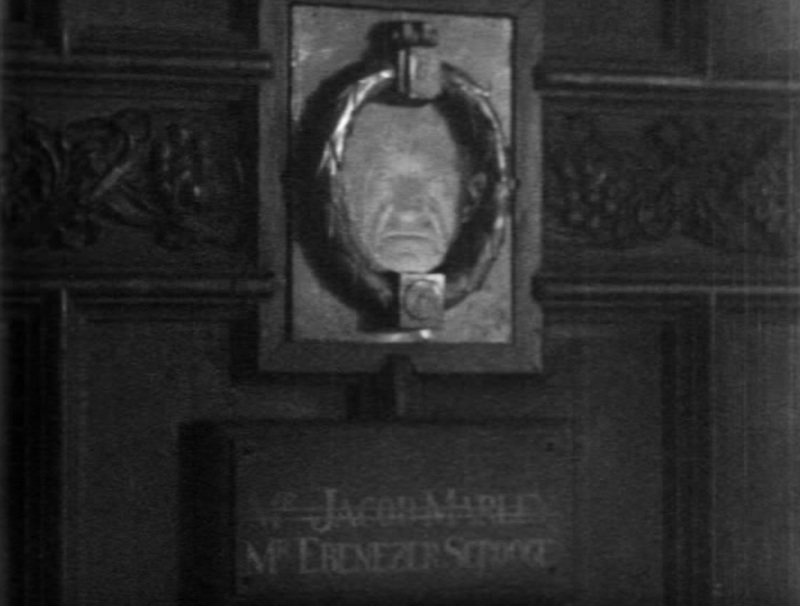 As he approached the door, there was a clear view of the ordinary (and rather plain) knocker, but when Scrooge has found his keys and looks up to put them in the lock, he's startled by Marley's face superimposed over an otherwise featureless knocker. It fades away before Scrooge's eyes. Inside, Scrooge looks kind of suspiciously at the back side of the door, something that Dickens mentions, but most adaptations don't care about. He lights his candle and heads upstairs. There's nothing remarkable about the stairs. They're not wide and nothing happens on them. Scrooge is definitely frightened though. He checks out his rooms with his cane held in front of him like a weapon. He rattles it under a table to make sure no one is hiding there. He pokes it into his bed and uses it to pull back the curtains. And in a great moment, he's spooked by his dressing gown that's hanging by the window and that certainly does look like someone's standing there. Even when he realizes what it is, he pokes it a couple of times to be sure. Satisfied, he checks out a last, little room that I first thought might be the lumber-room Dickens mentioned, because I hadn't done my research and assumed that a lumber-room was likely used for storing firewood. But a lumber-room was actually used in large, old houses to store furniture that wasn't being used. The extra room in Zemeckis' version is full of covered up furniture, so that's a proper lumber-room. I suppose this tiny closet off of Scrooge's bedroom in Edwards' film could also be a lumber-room, but it's a very humble one if so. He finally settles in to eat some gruel and the servant bell rings. It's just the one for a while and it starts timidly before picking up energy and eventually being joined by others. None of them are exactly clanging though; in fact, it's a rather pleasant chorus for the most part. Oddly, Scrooge gets up and goes to the window where he can look down at his front steps. It's weird, because none of the bells are door bells, but of course there's no one there and this makes Scrooge even more uncomfortable. The chimes slowly settle down, but with the last one is the sound of a door slamming shut somewhere else in the house. I like the quiet terror portrayed by Seymour Hicks. He's not visibly shaking and his face is composed, but there's worry in his eyes and he clenches his hands as if he's very cold. The closing door must have come from down the hall, because we only hear a couple of steps worth of dragging chains before Scrooge's door opens. Surprisingly - for those who know the story - there's no one there, but a voice says, "Look well, Ebenezer Scrooge, for only you can see me." It's a ridiculous thing for Marley to say when Scrooge is alone in the house, but of course he's referring to the viewers. And sadly, the entire scene is played with Scrooge's addressing an invisible Marley. I don't understand why we got Marley's face downstairs and this penny-pinching effect in Scrooge's room. Hicks' Scrooge has been characterized so far as a weak, miserable, old complainer and that continues in this scene. Confronted with Marley, he's trembling now and even his voice quavers as he begs for an explanation. He wasn't even that strong with Cratchit; he's completely at Marley's mercy. There's no argument about whether Scrooge is hallucinating and Marley never even has to raise his voice. Marley talks to Scrooge like a teacher instructing a disobedient student. Marley explains that Scrooge will be visited by three ghosts and even explains that they're the "visions of a Christmas Past, a Christmas Present, and a Christmas Yet to Come." He says that the first will arrive that night at midnight (different from Dickens' 1:00 am), but doesn't mention the schedule for the other two. His message complete, Marley apparently goes into Scrooge's bedroom, because Scrooge cries Marley's name a couple of times and follows the ghost there. The way Scrooge cries, "Marley!" is pitiful, like a child calling for a parent. That may be a better metaphor than the teacher/student one I used before. This Scrooge is so weak and Marley's voice is strong and commanding. Marley had to have been the dominant partner in their relationship and even though Scrooge is terrified, he doesn't want Marley to go. He probably wants Marley to stay and protect him through the coming visits. Scrooge goes back to look outside again, but the storm is gone now and the city looks peaceful. It feels like another money-saving effort that the movie cuts out the mourning spirits, but it's not the only adaptation to do that, so I can't be too upset. And the suddenly calmed snowstorm is a nice bit of spookiness to help Scrooge accept that he's not just imaging things. He certainly looks tired and defeated as he turns back towards bed. Interesting. Do you think this version loses some of the impact of the scene because of their cost-cutting measures? The impact of the image of a dead and desolate Marley, for example. Seems so, to me, just from reading your summary. I do think it loses some impact, because I don't see any creative reason for it. It just seems cheap.